Is Scott gonna be in it? Cause if he isnt there would be no point in making it would there? I mean he is the heart and sole of quantum leap. It would not be right if Scott wasnt in it. "There's this old saying. It says 'Don't change...anything.' "
I quite like the recent series of Doctor Who. Just set too much on Earth, but David Tennant is a brilliant Doctor. HI! I am new to this site and I am still trying to figure it out! Thanks for sharing your GREAT news! By the way do you know if the show will be returning to tv, of course re runs, any time soon and how I would find out for my local area? Yeah I like the new series, and with the Doctors new season 3 companion it looks like it will definitely be great, and this season the writers will definitely be taking The Doctor and Companions to more alien planets. Sorry if that's a mouthfull but I do tend to babble. Evil brain. Hello! I hope you can forgive me for being new and oblivious...but I'm really confused on this whole topic. I've read through the thread, but...I don't know, I may just be in denile. I read the interview with Trey, then I came here and it sounds like nothings happening or ever was...can you understand my confusion? I'd appreciate it if someone could very slowly and carefully and using small words explain to me what exactly is (or isn't) happening. Thanks! Does anyone else have some information? Please?! I think this is great news, but just how long is it going to be news? Surely with the dvd's selling well, it's about time someone thought about doing series (season) 6. Garry Williams. West Bromwich, England. OK, here's the thing. I have never thought a QL movie would come about, just because studios are mindnumbingly oblivious, and wouldn't know a good idea if it jumped up and started singing "Good ideas are here again" in a very loud voice. With that in mind, I'd like to point out that I also "knew" with every fibre of my being that a Transformers LiveAction Film would never be made (you may begin to see where I'm going with this). The Transformers Live Action film is due to premiere on 4/7/07. Some 23 year after the original TF movie. I'm not saying it will be good (it's almost certainly going to be heartbreakingly disappointing), but it gives hope for those of us desperately invested in seeing our movie dreams come true. A QL film will evetually be made (with massive, massive changes designed, no doubt deliberately, to completely alienate anyone old enough to have seen QL in the first place) and it will be so bad it will break all our hearts. But it WILL EVENTUALLY happen. I hope that somehow it does come about that a film is made, I know that a lot of rumours fly about and its only natural to think they are true but I hope one day we will be able to see the film. A complete ending to the whole fantastic series is justfied! 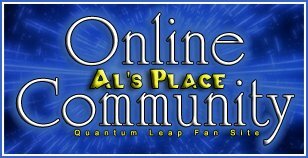 From Jason : I have been a long time fan of the “Quantum Leap” series. I was ecstatic to hear that they were making a movie and new series back in the winter of 2005, so I eagerly waited on pins and needles for it to be released. Sadly over a year later I haven't seen it or heard anything about it. Even when I researched it lately it seems to have disappeared. I did see that it was rumored to begin filming in January of 06 but that is it. Then I came across this site and wanted to see what I could dig up. Is there any light at the end of the tunnel for us die-hard fans? I would love to know any information you have.. So there you have it fellow leapers. Sorry the news couldn't be better. As long as Universal is in charge they'll do nothing. They still think QL was a show that lost a TON'O money and a few fanatics loved it. They tossed out the DVD sets here in the States like garbage. I'm still infuriated about that. I remember I think in 1993 at the QL Con in LA--I videotaped the huge signs they had in Universal Studios for all the shows. Law n' Order, ect. The one for QL was covered in Pigeon poop. Loaded with the dirty birds. Strangely, the others were untouched. It was sort of a mirror of what Universal was doing to the show. Without both Scott & Dean there should be no movie. Last edited by alsplacebartender; 03-29-2007 at 09:13 PM. Reason: why use **** when you can just say poop?